I started using OpenCaching North America early in 2015 and this cache has been on my radar ever since. It was and always has been the nearest OCNA-cache, not to mention the only OCNA-only cache in all of Hamilton- Halton-Niagara at the time (although I've been working hard to rectify that). So I don't know why it took me 2 years to finally give this one a shot, I've been withing range of it many times. I guess I really didn't think a cache placed in 2010 would be findable after 5, then 6 and now nearly 7 years. Too much leaf compost and fallen trees in that time. 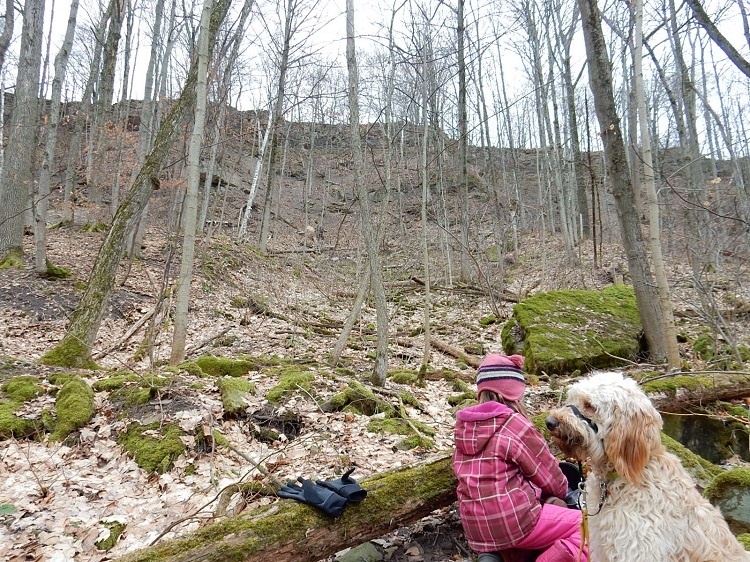 Anyway, for a number of reason we ended up on this section of the Bruce Trail this afternoon - the stretch from Fifty Rd to this cache which I haven't been on yet. And wow, this is probably the most scenic section between Grimsby and Dundas! And the conditions today were perfect. No snow, a nice even layer of compact yellow leaves on the ground, the trail dry and frozen but not icy. Perfect. Thoroughly enjoyed the walk in from Fifty Rd. Once we reached the cache site, surveying the area while considering what is stated in the listing, I could tell there was a good chance of going home without the find. Lots of potential spots. And a lot of leaf litter, frozen mats of leaf litter - and a few fallen trees which I'm guessing were still upright in 2010. figured I'd put in a good search and be satisfied with that. But you know, after checking maybe 10 spots - none of which seemed great - I noticed this one spot, a perfect spot in fact. And there was the cache. Perfect spot! Carefully opened up the frozen lock-and-lock. Dry! And well-stocked too. 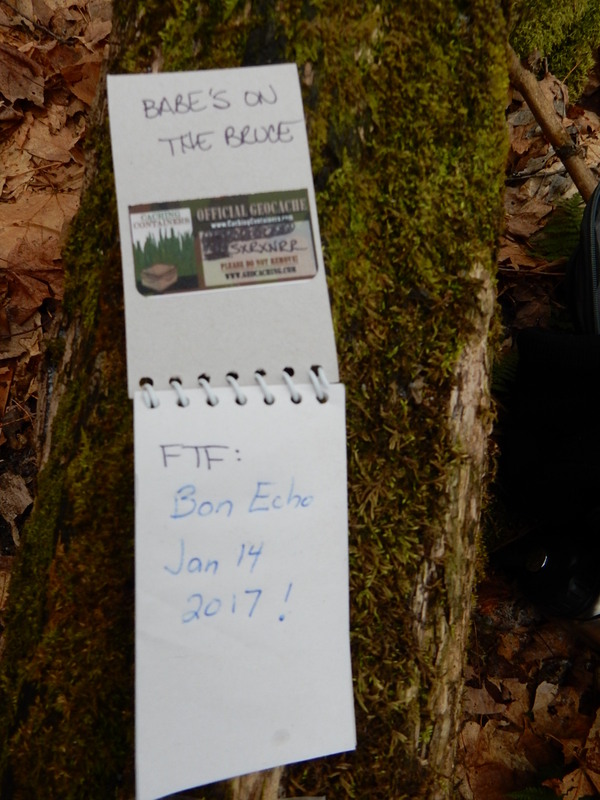 And then the moment of truth, the log book (it's not unusual for thee old caches to have finds in the logbook even though none are listed online). Nope, a true FTF. Wow that feels good. There is nothing that comes close to the feeling of finding geocaches and letterboxes that have been lonely for 5 or more years, and I know I'm slowly wiping all of those off the map. Most "newer" cachers (lets say those who signed up after 2010) never get the satisfaction of finding a lonely cache - there's just too many playing the game and every cache has it's own geotrail. Hunting these lonely, forgotten caches is the real treasure hunt. So thanks sxnrxnrr (and Geobabe) for leaving this one out for so long. It was really great being able to find it after so many years. Traded a few trinkets, signed the log, and added an OCNA card. The little one who came along for this one said "I was like 1 when this cache was hidden and last seen". Yeah, imaging that. 6 years, 8 months and 16 days since it was hidden; 5 years, 5 months and 4 days since it was listed. A long time either way. This cache get a Recommendation and an Excellent rating.